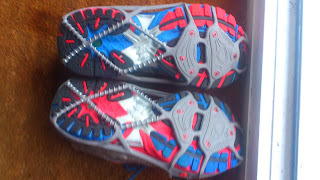 As we’ve still got a lot of snow around our way, I bit the bullet yesterday and forked out for a pair of YakTrax Run. I could have bought them cheaper online but needed them yesterday to be able to have a go at running outside, rather than retreating to the gym and the treadmill, and didn't have time to wait for delivery, so at lunchtime headed to Sweatshop and bought a pair. If you’ve not heard of them, YakTrax Run is a contraption that you pull over the sole of your shoe to give you traction on snow and ice, using wire coils and spikes. You can get more basic ones if you need them for walking around which just have the coils over the whole foot, or (the much more) expensive ones if you’re going to be running. I’m sure the walking ones would cope with running too, but I decided to go for the Run ones to give me the best chance of completing the mileage that I had on my schedule. I was a bit nervous about running last night because of the amount of compacted snow there was around, but after tweeting to everyone that I’d bought my YakTrax and was going to give them a go, I couldn’t back out! As soon as I got home from work, I got ready and then set about putting them on my shoes. It was a mission! The first shoe took me ages, and seemed like a work-out in itself, but once I realised how to do it, the second one was easy enough to get on. It felt a bit odd to stand in them but only momentarily and I soon got used to it, and once I started running, I knew that they had been a worthwhile investment. I only ran on the road or pavements (as it was dark and I still haven’t got myself sorted out with a headtorch) so don't know what they'd be like cross country, and although some community minded people had cleared a few sections outside their houses, which meant I had to clatter away on the tarmac, most of my 6 mile run was on compacted snow or icing up slush, but I didn't slip at all. 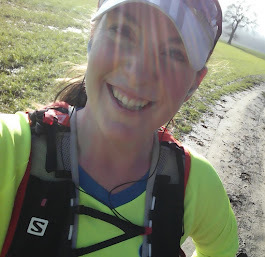 I did find that my gait changed, although I’m not sure if that was just because of natural caution, as opposed to wearing the YakTrak, but my stride was definitely shorter, with my feet landing more under my body, which is closest to the ideal way of running anyway (or so they say). 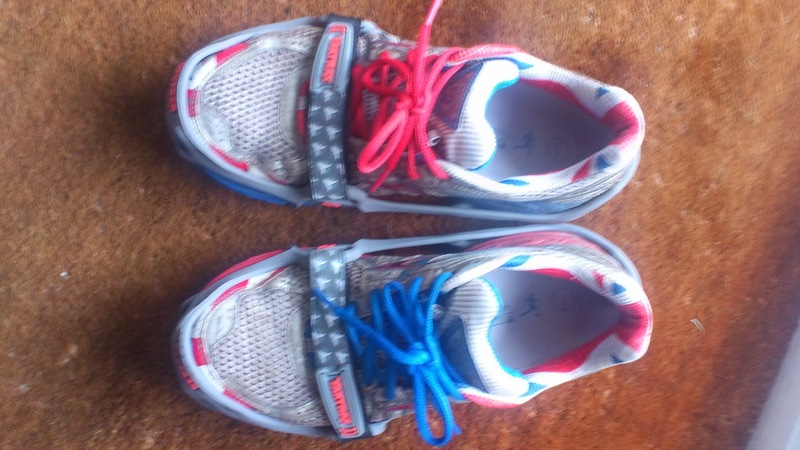 I was able to run at a normal pace though, and other than the clattering on the occasional bits of cleared pavements, I didn’t notice I was wearing them, they were comfortable and gave me so much confidence in the conditions. I was able to run up and down the hills, and was also able to enjoy the looks of astonishment and incredulity from the few people who were out tentatively walking home! So, all in all, a great purchase. I doubt I’ll have to use them very often, but it does mean that I don’t have any excuse to wimp out of a run just because the weather has got a bit wintery!